Sheets Shears Stones is a game of strategic hidden placement. 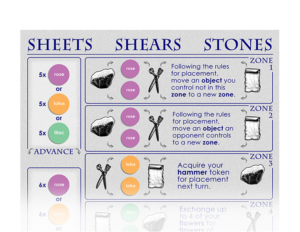 Secretly place your sheets, shears, and stones to take control of zones. If you place optimally, you will reap great reward, but your opponents can counter optimal placement to devastating effect. However, you too can counter their counter with strategic thinking.